William Morse ("Bill") Davidson, J. D. (1922 –2009) was an American businessman and a noted philanthropist. His dedication to the advancement of education led him to support Jewish education in the Diaspora as well as science education in Israel. The crown jewel of his generosity is the flourishing Davidson Institute of Science Education at the Weizmann Institute of Science. 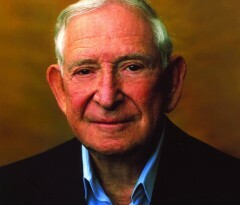 Bill Davidson was the President, Chairman and CEO of Guardian Industries, one of the world's largest manufacturers of architectural and automotive glass. He was also owner of several North American professional sports teams and a member of the Naismith Memorial Basketball Hall of Fame. Mr. Davidson was also the chairman of Palace Sports and Entertainment, and the principal owner of the Detroit Pistons of the NBA. As a businessman, philanthropist, and a devoted member of the Jewish community, Davidson made a difference, wherever he went. At a time when numerous words often replace real action, he used few words, but translated them into an impressive array of deeds. Davidson's belief that education and good management are the best tools for promoting economic growth and his commitment to quality education are both apparent in his other philanthropic endeavors. In addition to the Davidson Institute of Science, Bill Davidson established several other educational institutions such as the William Davidson Institute at the University of Michigan; the William Davidson Faculty of Industrial Engineering and Management and the William Davidson Chair in the IE&M Faculty at the Technion; the William Davidson Graduate School of Jewish Education at the Jewish Theological Seminary of America in New York; and the Davidson Center at the Jerusalem Archaeological Park. In 1997, the Council of Michigan Foundations honored Davidson for his lifelong philanthropic efforts locally, nationally and internationally. He was listed as one of America’s most generous donors in a New York Times article that same year. After the Yom Kippur war, Bill Davidson received the Prime minister club award for outstanding Philanthropic deeds towards Israel. Bill Davidson died on March 13, 2009 in his home at the age of 86. He was succeeded by his wife, Karen, and their children.